Starting a business takes money; there’s no way around that. You need money for licenses, a website, marketing materials, office supplies and just plain living expenses, as you build up your clientele. That’s why most coaches suggest that while you are working, you should build up a reserve of 6 months to a year of cash to live on. When you leave your job, you can then use those funds to get things up and running. Sometimes though, you get a little boost from an unexpected source. Over the last couple of days, I spent some time catching up with the pocket change I toss in a jar at the end of the day. I usually wrap it up once a year and take it to the bank, and it often adds up to a couple of hundred bucks. That comes in handy around Xmas. This time though, I found quite a stash. I guess I’ve been remiss for the last couple of years or so. I actually found a couple of extra jars that I totally forgot I had. Seems at some point, I’d moved a jar or two off the top of the dresser and into a chest beside the dresser. Guess I wanted to make them less conspicuous for some reason or other and forgot they were there. Anyway, after wrapping coins for a couple of hours a day over a couple of days, I ended up with a lot of rolls of change. So much in fact, that they were too heavy for me to get them all to the bank at once. After two trips, turns out there was over $1200 total, and that’s now deposited in the bank earning (minuscule) interest. What’s not to like about that? I can use most of it to bootstrap my business. There should be a little bit for my Xmas present too. Don’t ya think? The Fraser River is a working river. Tugs, logs, freighters, containers and even fishermen are on the river pretty much all year round. I think I’ve only seen the lower Fraser Valley portion freeze over twice in my lifetime, and even then it didn’t freeze hard enough to stop traffic. It’s pretty much an open port all year. 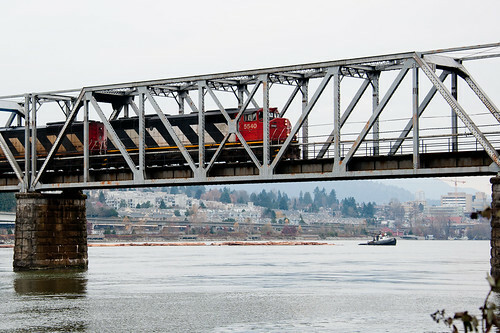 I tried to catch a bit of that here, with the train going over the bridge and the tug churning along with it’s log boom, just on the other side. It would have been nice to catch some containers on the train, but you deal with what you have, right? Further west on the river there are container ships and car freighters that dock at Fraser Port and Annasis Island respectively. Pretty much every car that comes to Canada from Asia, comes through the port on Annaisis Island. Fraser Port distributes containers across Canada and into the United States. It’s a busy port on a busy river.